Seven years in the making, this valuable book is wonderfully practical. It includes a chapter on fitting-out your own dark room. 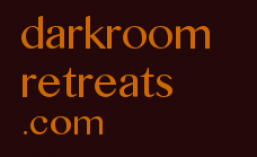 An experienced darkroom retreater, Andrew has built a dark retreat dome in guatemala, given talks on darkroom retreating, facilitated 18 retreats for 18 people in Guatemala, and for other retreaters in Sweden, Norway, and Spain. And he continues this life work in Spain to date. Safe download PDF if you can buy 2 coffees, consider donating.